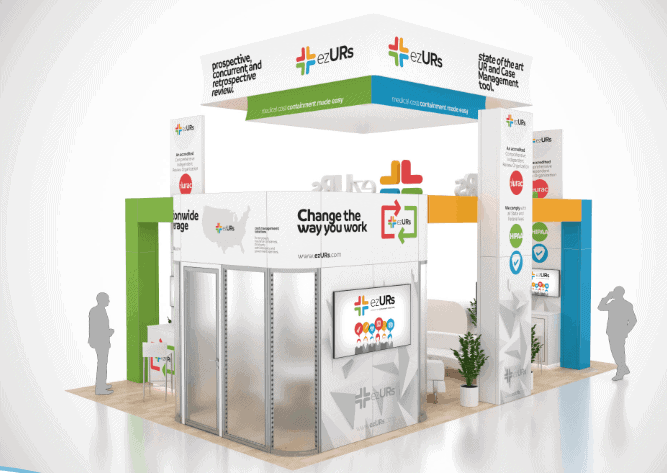 A large central modular structure is the most prominent eye-grabbing feature of the 20 x 30 Trade Show Booth Builder stand. There is a creative mix of multimedia technology and bold, bright graphics to attract and captivate visitors. Other features include comfortable cushioned seating in a waiting area, video displays placed on all walls, wood floors, reception area with a branded counter with storage, private room for meetings, storage space, kiosks, and sizeable top head overhanging graphic logo sign. Exhibit Experience is a local tradeshow contractor offering turnkey exhibits with fabrication in Las Vegas and Orlando. Las Vegas exhibit production and Orlando exhibit production can be completed within 45 days. For more information in regard to 20 x 30 Trade Show Booth Builder, give us a call at (800)-354-6022 or send us an email at [email protected] Contact us today for your complimentary consultation.